No, I'm not obsessed with cats. I can paint any other subject if I want. Non, je ne suis pas obsédée par les chats. Je peux peindre n'importe quel autre sujet si je veux. 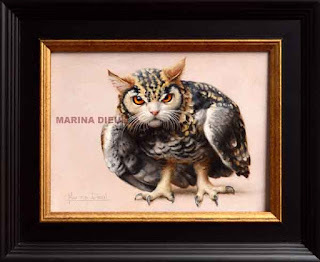 Marina Dieul was born in France. She showed great interest in painting and drawing from an early age, and her family encouraged her vocation. In early 2000, she moved to Montreal, Canada, where she now lives. Her work has received numerous awards and honors, including the Kingston Prize, the Portrait Society of Canada, the Artist Magazine, and International Artist Magazine, among others. She won the William Bouguereau Best of Show Award, and first place in the drawing category at the Art Renewal Center Salon, the Best of Show in the "Inspiring Figures" exhibition (Butler Institute of American Art) and two Awards of Exceptional merit at the Portrait Society of America’s international competitions. She has been selected as a Living Master by the Art Renewal Center. Marina Dieul is known for her animals and figures paintings in trompe-l'oeil style, full of humor and poetry. She lives surrounded by the many cats she fosters for a no-kill shelter in Montreal. Copyright Marina Dieul. All rights reserved. No part of this site may be reproduced with out prior, written consent.